A vast number of grape varieties have several names, depending on where they’re grown. So what’s in a name? Are they always interchangeable, or does their place and name hold a clue to their style? You can be forgiven if you think Syrah and Shiraz are different grapes. The wines can taste almost like polar opposites. Their body, expression and texture change with the climate. 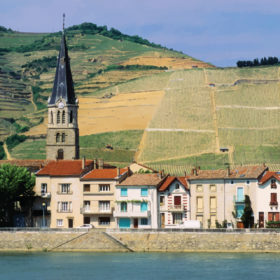 In the temperate northern Rhône Valley of France, Syrah is the grape behind such storied appellations as Côte-Rôtie and Hermitage. Further south, it forms the backbone of countless Côtes du Rhône blends and is an essential part of many rustic Languedoc reds. Known as Shiraz in Australia, its style is most distinct in the hot Barossa and warm McLaren Vale regions, but it also thrives in cooler Canberra. Where Northern Rhône Syrah has firm, drying tannins, Australian Shiraz is like mouth-coating velvet. French oak accentuates Syrah’s visceral notes of cured meat, yet American oak lends vanilla and chocolate tones to Aussie Shiraz. Both can have heartstopping notes of violet. Then there are the spice flavors, such as white pepper in cooler regions and black pepper in warmer ones. Where Northern Rhône Syrah has firm, drying tannins, Australian Shiraz is like mouth-coating velvet. Syrah/Shiraz can also occupy delicious middle ground. In New Zealand’s Hawke’s Bay, it’s luscious with fruit, but suggestive with pepper. In South Africa, it veers toward spicy richness, while in California and Washington, it can be smooth and big, or edgy and taut. In short? The name is a clue to style. Shiraz is likely big and bold, while Syrah tends to be snappy and more slender. Pinot Grigio assumes many aliases across Europe, like Fromenteau, Pinot Beurot, Ruländer and Szürkebarát. The grape is very much a chameleon. It can produce bottles ranging from easy-drinkers to full-flavored whites. Don’t sneer at Pinot Grigio, especially from Veneto in northern Italy. It has given pleasure to many, with relative simplicity being its chief virtue. This is the result of high yields and neutral winemaking techniques. Further north in Friuli-Venezia Giulia and Alto Adige, Pinot Grigio is cropped at lower levels and produces spicier, elegant whites. In Germany, where it’s known as Grauburgunder, it generally has expressive, rounded pear notes. Easy-drinking, lighter versions are labeled Pinot Grigio, while rounder wines, often with some residual sweetness, are designated Pinot Gris. Alsace, located in northeastern France, is where Pinot Gris reaches its zenith. While there are many easy-drinking versions, they tend to be rounder, weightier and spicier, often with a touch of residual sweetness. Grown in the delimited Grand Cru vineyards, Pinot Gris makes full-fruited, rounded whites heavy enough to accompany red meat and suitable for aging. This Italian-French stylistic divide has become international shorthand. Easy-drinking, lighter versions are labeled Pinot Grigio, while rounder wines, often with some residual sweetness, are designated Pinot Gris. White Zinfandel is the wine that’s launched thousands of enthusiasts. But the pink stuff barely does justice to this historic grape. It’s known as Tribidrag or Crljenak Kaštelanski in its native Croatia and Montenegro, as Primitivo in Puglia and as Zinfandel in California. Quality mature Zinfandel is one of the world’s greatest joys. As a red wine, Zinfandel always boasts full, juicy and plump fruit that covers a spectrum of ripeness, often with elevated alcohol levels. When made well, Zinfandel balances these qualities perfectly. There’s something enticing about the fruit. Grapes in the same bunch can be barely ripe, overripe, or even raisined. In Puglia, Primitivo is generous, smooth and warming. On an inland elevation, Gioia del Colle produces the freshest versions, while coastal Primitivo di Manduria is strong, dense and powerful. In Croatia and Montenegro, Tribidrag is produced as a fruity local wine. In California, this oft-rustic red attains true elegance. Some ancient Zinfandel vines in Napa and Sonoma bring forth concentrated, full-bodied wines with warm alcohol and expressive, enticing red fruit aromas. Quality mature Zinfandel is one of the world’s greatest joys. Grenache beguiles wine lovers across the globe with its luscious red fruit flavors. Grenache is an archetypal Mediterranean variety. It wants full sun, will withstand heat and drought and it thrives on meager, stony soils. This resilience explains its success and spread in warm climates. Vinified on its own, Grenache is full-bodied without being tannic. With Grenache’s softness and plump fruit, it adds its juicy allure and warmth to Châteauneuf du Pape, is integral to Côtes du Rhône and part of the holy trinity of Australian Grenache-Shiraz-Mourvèdre (GSM) blends. As Garnacha, it can also form part of Spanish Rioja. Vinified on its own, Grenache is full-bodied without being tannic. It can also make charming, aromatic reds in the Rhône cru villages of Vinsobres, Rasteau, Gigondas and Vacqueyras. As Cannonau in Sardinia, it’s bigger, stronger and bolder. Grenache vines are long-lived, and the variety hits its stride in the old-vine Grenache wines from the French Roussillon, neighboring Spanish Priorat and McLaren Vale in Australia. The wines are concentrated and fragrant with spicy red fruit. But Grenache is versatile. It also makes the sweet, fortified wines of Banyuls and Maury, and the dry, fully pink rosados of Navarra. No matter the style or origin, Garnacha always trumps with its gorgeous red fruit. Ancient and dark, powerful and brooding, this thick-skinned, small-berried grape of Spanish origin thrives in hot climates. Mere warmth won’t do for this late ripener. It needs proper, sustained heat. Mourvèdre is at home on the Mediterranean coast in Spain, where it’s called Monastrell, and forms the gutsy, heavy, tannic reds of Yecla, Jumilla and Alicante. As Mourvèdre, it’s the backbone of Provençal Bandol, where it gives oomph to reds and a lovely tannic tang to dry rosés. In the Languedoc, it’s a valued contributor to numerous red blends. In Australia, where it’s known as Mataro, the grape asserts its dusky charms in GSM blends. Few pure varietal Mataros are made, as they benefit from a little softening with Grenache. The best examples have a heady perfume of black fruit in youth, and of leather and spice with age. Today, Malbec is synonymous with Argentina, where this aromatic, black grape revels in the bright, high-altitude sunshine of the Andes. A French original, it’s almost supplanted by the Argentine success. Malbec is sometimes referred to as Côt in France. It’s even one of the five permitted varieties in red Bordeaux, but ripens unreliably there. Malbec’s real French hotspot is in Cahors, a town in southwestern France as well as a namesake appellation. Cahors wine is inky, opaque and dense with tannin. The firm, astringent tannins of French Malbec are often softened with the addition of Merlot. Malbec in Argentina, however, are ripe enough to have the soft crunch of starched velvet. In both cases, the wines’ structure helps them age and develop. The best show floral overtones of violet and peony. In France’s cooler Loire Valley, Côt produces wines that are less extracted, very fresh, crunchy and often spicy. Chenin Blanc, in its many expressions, is at home in the cool Loire Valley, where it is also called Pineau de la Loire. Here, it takes pride of place in the central stretch of this river from Blois to Savennières. Its acid is high, and its expression always tinged with apple flavors that range from green to dried. When treated with respect and at lower yields, Chenin Blanc makes stunning wines, from dry, lively whites with papaya hints to oak-aged, richer, rounded styles. Chenin Blanc’s stylistic breadth is astonishing. It’s dry, concentrated and powerful with equal expression of stone and fruit in Savennières. The grape is lush and sweet with botrytis in Bonnezeaux, Quarts de Chaume and Coteaux du Layon, while it’s vivid, expressive and underrated in both dry and off-dry expressions in Montlouis and Vouvray. It’s inherent acidity that makes Chenin Blanc such a popular grape in South Africa, where it’s referred to as Steen. There, sunshine and temperatures coax tropical expressions from the grape. When treated with respect and at lower yields, it makes stunning wines, from dry, lively whites with papaya hints to oak-aged, richer, rounded styles. Most good Chenin Blanc improves with age. Even dry wines attain a honeyed edge. It also makes base wines for excellent, traditional-method sparklers. Interpol would have its work cut out with this grape’s multiple identities. Vermentino thrives in Italy, France and on the islands of Corsica and Sardinia, prized for its fine, crisp acidity. It loves coastal vineyards and used to be relatively obscure as Rolle in southern France. There, its zesty freshness is a welcome addition to countless Provençal and Languedoc white blends. On its own, Vermentino shows mettle, where it showcases citrus aromatics and inherent crispness. From the Tuscan coast, it evokes citrus-scented sea breezes. Pigato, from Liguria, while still fresh, is a little more robust and structured. As Vermentino di Gallura from Sardinia, the grape is almost full-bodied with intense, medicinal notes of lemon balm and yarrow. When grown inland, as Favorita in Piedmont for instance, it’s perfumed and pure. More recently, Vermentino is also finding a new home in Australia. The temperate and distinctly continental latitudes of Central Europe are home to this underrated red grape. Fairly full-bodied for such northerly reaches, Blaufränkisch produces structured, elegant wines. In eastern Austria, it’s known as Blaufränkisch. In southern Germany, it’s Lemberger. It also goes by Kékfrankos in Hungary, Frankovka in northern Croatia and western Slovakia and Frankinja in eastern Slovenia. No matter the name, it produces quality reds that age well. It also forms part of Egri Bikaver, Hungary’s historic “bulls’ blood” wine. Cooler vintages or sites add an irresistible pepperiness to the usually dark-fruit spectrum, where you’ll find dark cherry and blueberry. Despite the differences in climate and expression, Blaufränkisch exhibits great varietal resemblance. Vinified in stainless steel, Blaufränkisch is sometimes confused with fuller-bodied Gamay. When vinified in small, new oak barrels, Blaufränkisch attains some punch and needs a few years to return to its inherent subtlety. The most elegant results are achieved with gentle handling and judicious amounts of oak. We’ll likely hear a lot more of this variety once it goes global. What Does "California" on a Wine Label Really Mean? What Do We Mean When We Say Rhône-style Wine? What Does it Take to be an Enthusiast 100?